Professional teeth whitening conducted by an experienced cosmetic dentist can effectively remove many instances of teeth discoloration and staining to restore bright, vibrant smiles. But some patients with deep stains may benefit from porcelain veneers. 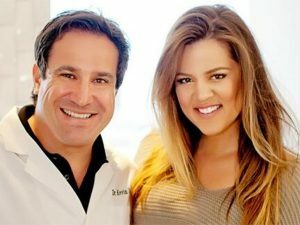 Beverly Hills cosmetic dentist Dr. Kevin Sands is dedicated to finding the best solution for your unique dental needs and aesthetic goals. Please call the office of Kevin Sands, DDS, Cosmetic Dentistry at 310-273-0111 to schedule your personal consultation. Porcelain veneers can actually be used to address a wide range of common cosmetic dental problems, from cracked teeth to misaligned teeth to stained teeth. When it comes to treating stains, porcelain veneers can mask deep stains that teeth whitening cannot eliminate. Tetracycline and some other drugs can cause subsurface stains and severe discoloration, as can excessive fluoride, dental trauma and other factors. In circumstances in which these deeper stains are present, Dr. Sands may recommend porcelain veneers over teeth whitening. Porcelain veneers are thin slivers of porcelain that are bonded to the surfaces of your teeth for a seamless smile. The dental-grade porcelain used in your custom-made veneers is tinted to resemble healthy, natural teeth. For examples of the appearance of porcelain veneers, please see our Smile Gallery. If you live in the Beverly Hills area and would like to learn if porcelain veneers are right for you, please contact Kevin Sands, DDS, Cosmetic Dentistry.